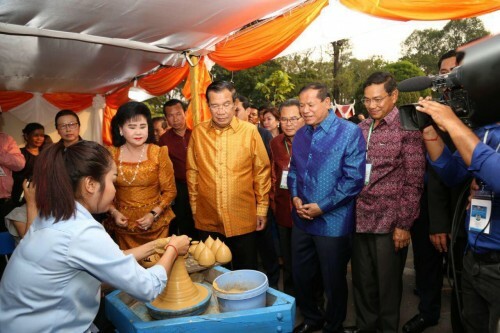 Cambodian Prime Minister Hun Sen ordered all ministries and relevant institutions to prevent sand dredging, illegal fishing, and logging of submerged forest, addressing at the 5th River Festival held Saturday in Kampong Chhnang province. “We shall find ways to address bank erosion and shallowing of river; prevent anarchic dredging, illegal fishing, and submerged forest loggings. These are factors leading to our river degradation and decrease of tourists,” Prime Minister stated. Prime Minister further explained that the submerged forests are the habitats of fishes and the attractions for local and international tourists who would love to see biodiversity and aqualife spectacular. “We are not capable enough to control water current,prevent bank erosion and the shallowing of our river due to cumulativeness of eroded silt during the rainy season,” the Premier said, but pledged to mobilize budget to address the above man-made concerns; and urged for joint cooperation nationwide to launch campaign on “love nature” and effective usages of natural resources. “A century ago, we have deep water, abundant fish, and less people; today we have more people, less fish, and shallow water combined with the anarchic activities of sand-dredging, fishing, and loggings,” Prime Minister warned.